Microsoft Development Center Copenhagen (MDCC) is Microsoft’s biggest development center in Europe and is located just north of Copenhagen in Denmark. Around 650 employees are working at MDCC, including a significant number of highly specialized software developers recruited from all over the world. In 2008 and 1009, MDCC was rated the "Best Place to Work in Europe” by the Great Place to Work Institute (more info). The staff counts more than 40 different nationalities making MDCC one of the most international companies in Denmark. We offer internships at Microsoft in Copenhagen of 9 to 12 months. At the end, you might get the opportunity of a full-time job with us, or you might choose to get back to school (if you interrupted your studies), or continue your career as you like. In any case, Microsoft on your CV can be a good advantage. Software development expertise, particularly within C#, C++ or similar object oriented programming languages, Strong technical and analytical skills, Excellent problem solving and design skills. Ability to work independently – and in teams. An excellent command of written and spoken English. We are looking for engineers with a strong background in object oriented development. Experience business applications or ERP solutions is a plus. Working toward an academic degree within computer science, engineering, mathematics, physics. Good academic results are a plus (make sure to mention them in your CV), but they are not mandatory. Write and review technical requirements and design documents. Plan, design, and write code for automated tests of features within the Core ERP, presentation tier or Dynamics platform. Create and use test tools and processes to both increase effectiveness in the daily work and assure quality of the product. You will gain valuable experience working on a world-class product development team and learn what it’s like to work at Microsoft. Each trainee will work on real projects that contribute to the success of Dynamics Products which is used by over 1 million customers. You will work on the Microsoft Development Center Copenhagen (MDCC) campus. The work environment is truly international with over 40 different nationalities working under the same roof. Each trainee will be provided desk and PC and a mentor to help guide them through their work experience. The campus is situated on a wooded, park-like site, complete with sports fields and walking trails just north of Copenhagen and easily accessible by train or bus. Free beverages and fruits are available for you the whole day. Breakfast, warm lunch, are part of the package offered to all employees. You will have access to the latest technologies and the best hardware equipment. Sports events and other entertainment is regularly organized at discounted prices. If you are a student in the last 2 years, a fresh graduate or a master’s at AC, send your CV to bogdana.botez@microsoft.com. The sooner you apply the more chances you get to be processed in time to get an interview invitation. We will travel to Bucharest on 23rd and 24th of April. If you are selected, you will have the chance to meet us at a "per invitation" interview in Bucharest, with the travel expenses covered by Microsoft. 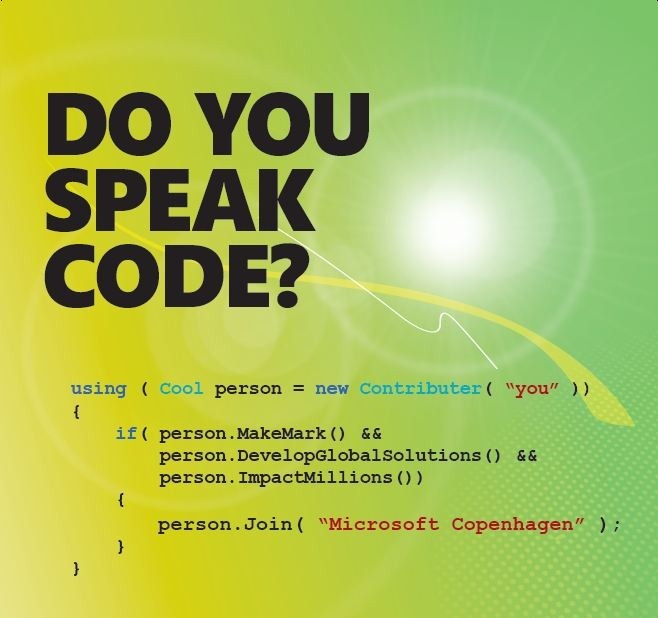 For more information on Microsoft Development Center Copenhagen, you are welcome to check our website, http://www.mdcc.dk.